I had been looking for information about contemporary heathenry in Germany without luck and then I ‘accidentally’ run into this book. I do not even remember how. 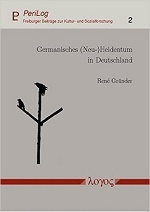 “Teutonic (Neo-)Heathenry In Germany” is a small book of 120 pages written with the distant view of an anthropologist and therewith not entirely what I hoped to find. The book makes a nice read though with some information that I did hope to find. The book is largely defining definitions and placing contemporary heathenry in a larger context. The author sees three phases for paganism in Germany that also represent three currents. From the 1900’s there are “Völkish” / “folkish” groups, often of an Ariosophic breed. From the 1970’ies there are ecological and New Age groups that grow into “eco-spiritual” and “tribal” groups. Again a few decades later, the “universal” groups start to emerge and the “folkish” elements start to be repressed in the larger heathen community. Gründer mentions more groups in Germany than I knew, but following his scheme on page 92, I can give you in idea of the heathen landscape in Germany. Gründer mentions seven groups that he names “ariosophisch”: the Armanen Orde that was founded in 1908 and refounded in 1976. The order currently has about 100 members. The Goden-Orden was founded in 1957 and has about 100 members. The Artgemeinschaft – GGG e.V. was founded in 1951 and has about 150 members. The Dorflinde e.V./ Mittgard-Orden was founded in 1992 and has 10 people involved. The author puts these four groups in the “dogmatic” section of his scheme. “Undogmatic” yet “Ariosophisch” are Arbeitsgemeinschaft naturreligiöser Stammesverbände Europas (ANSE) e.V. (‘working society natural-religious tribal unity from Europe’), number of members unknown. Deutsche Heidnische Front (‘German Heathen Front’) has existed from 1996 until 2005 with about 15 people involved. Arbeitskreiz Naudhiz e.V. was founded in 2000 and has about 20 members. Gründer not only divides the groups in “dogmatic” and “undogmatic”, but also in “universalistic” and “Völkish”. The second group of “eco-spirituals and tribalists” are halfway universalistic and Völkish. These groups are Yggdrasil-Kreis e.V. (‘Yggdrasil circle’), founded in 1974 and with about 50 members. Germanische Glaubensgemeinschaft e.V. (‘Teutonic faith society’), founded in 1991; 150 donators, around 15 members. Verein für Germanisches Heidentum e.V. (‘Society for Teutonic heathenry’), the German part of the Odinic Rite, founded in 1995 with about 60 members. Those were the “dogmatic” “eco-spirituals”. “Undogmatic” are the Heidnische Gemeinschaft Berlin e.V. (‘Heathen society Berlin’), founded in 1985; 150 donators, 15 members. The last group are the “postmodern” and “anti-Völkische” groups with one “dogmatic” group called Nornirs Aett (1994, 18 people involved). “Undogmatic” are Rabenclan (‘Raven clan’) (1994, 100 members). Eldaring – The Troth Deutschland e.V. (2001, 200 members) and Asatru-Ring-Frankfurt (2005, 20 people involved). So there you have the ‘scope of heathenry’ in Germany with a tiny bit of history and magnitude. Of course the numbers are from 2008, but this is better than nothing. There is, of course, more information in this book. Gründer also has a timeline and scholarly reflections which may (or may not) be a reason to get this book.